Ryan completed the Registered Massage Therapy program at the West Coast College of Massage Therapy. As a believer in ongoing education, Ryan takes pride in staying current with learning the latest knowledge and massage therapy techniques. 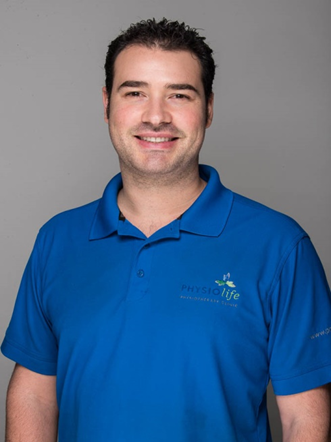 Ryan`s favourite part of being a massage therapist is building genuine connections with his clients and helping them recover from any ailment they may have. Prior to becoming a massage therapist, Ryan studied sport science at Douglas College in New Westminster. His knowledge and personal interest in sport and fitness make him the ideal therapist for someone suffering from sport-related pain or injury. Through his practice, Ryan has also had the opportunity to work with clients at various levels of physical ability. He has worked with individuals struggling with Multiple Sclerosis, Parkinson’s, fibromyalgia, and a variety of other conditions. When not at the clinic, Ryan enjoys training in Kung Fu, reading, and spending time with his wife and cats. He also enjoys many outdoor activities such as fishing, camping and swimming.